What Does "Clean Eating" Mean? The first time I heard the word ‘clean’ in relation to food was back in the mid 1990’s. Supermarkets noticed that customers were beginning to look beyond info like calories, and towards ingredient lists. Health conscious shoppers were starting to pay attention to how foods were made, and exactly what they were made from. As a result, health food stores—which stocked fresh foods and simple ingredient products—were attracting more and more consumers, and traditional grocers took note. Fast forward to today, and clean eating has gone mainstream, fostered by people from all walks of life, who want to feel good about what they’re putting in their bodies. This includes moms, who want the healthiest, most nourishing food for their children; millennials, who value natural living; and older adults who are motivated to maintain wellness and support longevity. The basic principle of clean eating is to let ingredients guide you. While it’s not realistic to never eat anything that comes out of a jar, box, or bag, it’s important to choose packaged foods with all natural, recognizable ingredients. For example, chickpeas from a can would be considered ‘clean’ if the only ingredients are chickpeas, water, and sea salt. The same is true for bagged greens with the only ingredient being kale, or frozen blueberries with no additional ingredients. The idea is to slash your exposure to artificial additives and chemicals used in highly processed foods, as fillers, preservatives, flavor enhancers, colors, and the like. Recent research has shown that exposure to these man-made ingredients can harm health, from taxing immunity, to fueling inflammation, and possibly even contributing to obesity. But clean eating is also about how the foods we buy impact the health of the planet, and our ability to support an eco-friendly and sustainable food supply. All of these vital issues are why clean eating is not a trend, but rather an important consumer movement. In addition to seeking out foods with ingredients you easily recognize, clean eating involves putting them together to make nutrient-packed meals and snacks. Some simple swaps to trade processed fare for fresh, clean food include: eating oats or a smoothie made with fruits and veggies for breakfast instead of a muffin or danish; snacking on nuts and fruit or veggies and hummus rather than chips; or whipping up a veggie-packed stir fry instead of microwaving a frozen entrée. There are dozens of tasty recipes on www.rawl.net to guide you, and you’ll notice that many use simple, all natural ingredients—like extra virgin olive oil instead of margarine, and whole quinoa or beans in place of refined starches. That’s a big part of our Back to Fresh philosophy. Tell us about the clean eating changes you’ve made and your favorite whole food-based recipes and meals in the comments or on social media @naturesgreens! Pregnancy is truly a life-changing experience. During pregnancy, your body goes through profound changes and certain nutrients are needed to fuel those changes. Following a well-balanced diet rich in nutritious, whole foods is an important aspect of a healthy pregnancy. It helps increase your chances of having a smooth pregnancy and also gives your developing baby the healthiest possible start in life. Basically, a healthy diet helps make a healthy baby! During pregnancy, you need to consume more calories and protein than before you were pregnant. You also need to consume more micronutrients including folic acid, iron and calcium. These are essential for the proper growth and development of your baby as well as for your own health during pregnancy. It’s recommended that pregnant women take a prenatal vitamin to fill in any nutritional gaps. But did you know that you can get these nutrients from foods such as leafy greens? One cup of chopped turnip greens provides a whopping 107 micrograms of folate, which is 27% of the recommended daily amount. It also provides 105 milligrams of calcium, which is 10% of the recommended daily amount. Other greens like kale, collards and mustard greens all provide these nutrients as well, in varying amounts. In addition, leafy green vegetables also provide an array of other important nutrients including fiber, vitamin A, vitamin C, vitamin K, potassium, manganese and copper. Folate is one of the most important vitamins needed in pregnancy. It’s essential for the synthesis of DNA and for proper cell division. It’s especially important for the development of the neural tube, which forms the baby’s brain and spinal cord. Folate is found naturally in foods like leafy green vegetables, lentils, asparagus, and beets. Folic acid is a form of folate that is used in dietary supplements and foods. In the United States, breads, cereals, flours, pasta, rice and other grain products are supplemented with folic acid. Iron is necessary for making hemoglobin, the protein in your red blood cells that carries oxygen to your organs and tissues as well as to your baby. During pregnancy, you need much larger amounts of iron to support the growth of your baby and placenta. Like folate, many grain products are supplemented with iron. Leafy green vegetables such as kale, mustard greens and spinach also provide iron. However, the type of iron found in plant-based foods (non-heme iron) is not as easily absorbed by our bodies as the iron found in meat, seafood and poultry (heme iron). A simple way to increase the amount of iron absorbed from vegetables is to eat vitamin C-rich foods with your meals. Vitamin C greatly increases the amount of iron your body absorbs. So the next time you’re sautéing some kale or mustard greens, sprinkle some lemon juice on top or throw in some bell peppers, which provide a good amount of vitamin C.
Calcium is the most abundant mineral in our bodies. Although 99% of it is stored in our bones and teeth, calcium serves many vital functions including maintaining a normal heartbeat, contracting muscles, transmitting nerve impulses, and clotting blood. It’s important for pregnant women to get enough calcium, especially during the third trimester when your baby’s bones are rapidly growing and their teeth are forming. If you don’t get enough calcium in your diet, your body will withdraw calcium from your own bones to supply your baby’s needs. Kale, collards, turnip greens and mustard greens are all a very good natural source of calcium. Calcium is also added to many foods like orange juice, plant-based milks, tofu, cereals and bread. So how can you incorporate more leafy green vegetables into your diet? Leafy greens can be added to a wide variety of dishes to add a boost of nutrition. You can enjoy them raw in salads or add them to dishes like soups, stews, pasta sauces, and stir-fries. Smoothies are another great way to incorporate greens into your diet. During pregnancy, there may be times when you don’t have much of an appetite and cold drinks may be better tolerated. To make a delicious smoothie, simply toss a handful of chopped greens to a blender along with your favorite fruit (like mango, pineapple, apple or watermelon) and some Greek yogurt or almond butter for a boost of protein and healthy fat. Add ice and blend away! More information and recipes can be found in my cookbooks, Natural Pregnancy Cookbook: Over 125 Nutritious Recipes for a Healthy Pregnancy and Natural Baby Food: Over 150 Wholesome, Nutritious Recipes For Your Baby and Toddler. Meal prepping is a trending behavior, and there are so many reasons why. Devoting time to prepping meals is a smart way to eat healthier, saving both time and money, and gaining control over what and how much you eat. There is no silver bullet to meal prepping, so if you’re just getting started, sample different ideas to find an approach that feels right for you. Meal prepping can involve making multi-serving meals to portion and store so they’re ready to re-heat and eat. But meal prepping can also mean pre-cooking, or even just pre-preparing ingredients, so you don’t have to start cooking from scratch. One savvy strategy that works for many people is to prep on the weekend for the coming week. This can be as simple as washing and chopping vegetables so they’re ready to cook, or pre-cooking a number of foods that can later be mixed and matched to create various meals. If you’re going to pre-cook several meal components, divide them into three key groups: vegetables, lean proteins, and healthy starches. Veggie prep can be as simple as purchasing ready-to-eat greens to stash in your fridge. You can also dress chilled vegetables or greens in herbed balsamic vinaigrette, pre-make healthy salad dressing so it’s ready to use, or sauté, grill, or oven roast a variety of vegetables to be re-heated when needed. Prepping lean proteins can be as easy as stashing canned beans or wild salmon in the fridge, so they’re chilled and ready to add to salads. You can also cook and store hard boiled eggs, chicken breast, extra lean ground turkey, or seafood. Toss beans, chopped hard boiled eggs or canned salmon with jarred pesto, hummus, or seasoned tahini to pre-make quick protein salads. Or purchase a cooked rotisserie chicken for a meal prep super shortcut. For starches, store pre-cooked whole grains, like brown or wild rice and quinoa, as well as starchy vegetables, including baked sweet potatoes, fingerling potatoes, and oven roasted butternut or spaghetti squash. When you have these components at the ready, all you need to do is decide how to put them together. For complete meals don’t forget to add a healthy fat, like extra virgin olive oil (EVOO) or EVOO-based pesto, olive tapenade, avocado, nuts, or seeds. For example, toss a generous portion of roasted or sautéed veggies with spaghetti squash and diced chicken breast, served over a bed of greens. Make a grain bowl by topping a small scoop of quinoa with greens, roasted or sautéed veggies, lentils, and drizzle with a spoonful of pesto. Pair a generous portion of grilled veggies with black beans, brown rice, and a side of avocado. Stir fry pre-cut veggies in vegetable broth, seasoned with ginger, garlic, and chili pepper, paired with steamed shrimp over wild rice, topped with sliced almonds. Another way to meal prep is to make a second meal at dinner time and pack it for lunch the next day. These simple and practical meal prepping solutions can help you avoid poor eating pitfalls and give you the tools to eat healthfully for the long haul. How do you Meal Prep? Please share your own tips and tricks--as well as the meals from our website you like to make ahead--as part of your meal prep routine. Show us by tagging us on Instagram @naturesgreens and use #backtofresh. Your tip could be selected and featured on our account! We know how hectic this time of year can be. With the weather warming up, the extra hour of daylight each evening, and the ﬂurry of spring-time activities, you want to spend more of your time with your family and friends and less time preparing meals in the kitchen. You’re looking for meals that come together quickly at the end of the day, but still provide plenty of fresh, nutritious, and delicious food for your family. The best way to achieve this goal is to take the time to prepare for the week ahead with a couple hours of meal prepping on your Sundays. Never meal prepped before? We’ll walk you through the process. What meals are you in the mood for this week? What fresh produce is currently in season? Visit our collection of recipes on our website and ﬁnd inspiration for what you want to eat during the upcoming week. Take note of the recipes that you know you and your family will enjoy. #2: Set the menu for the week. Go ahead and map out your week. Who will be home each night for dinner? Which evenings will you be short on time?What ingredients or meals can you easily prepare ahead of time for the nights you need a quick meal? By setting your game plan, you’re setting yourself up for success. You’ll be able to grocery shop efﬁciently, cut out the last minute fast food decisions, and eliminate the stress of ﬁguring out what to cook for dinner. Put it in writing and stick it to your fridge for a visual reminder throughout the week of your plan. #3: Create your grocery list and shop. Once you know what meals you plan to cook, create your grocery list and shop. You can use an app for your grocery list, such as Our Groceries, to organize your list and to easily have it on hand when you’re shopping. Pro Tip: use a delivery service like Shipt to shop at Publix, and save even more time each week without the hassle of going to the grocery store yourself. #4: Prepare ingredients and meals on Sunday evenings. After you’ve completed your grocery shopping, start your prepping. Take a look at each recipe to see what you can prepare ahead of time. Are there dry ingredients that you can measure out? Is there poultry that you can go ahead and cook? What vegetables can you chop and store in your refrigerator? There will be some things that you can’t do in advance, but you’d be surprised at how many items you can go ahead and have ready. Purchase our Versatile Veggies® Diced Yellow Onion and Nature’s Greens® Collard Greens. Measure out all of the dry ingredients, place in small container, and seal. We personally use mason jars for dry goods. Mince the garlic and chop the green bell pepper. Place in small Pyrex container, seal, and store in your refrigerator. Cook the spaghetti squash, remove from the rind, and store in your refrigerator in a sealed container. When it comes time to prepare dinner, all of your chopping and most of your measuring is complete! Your prep time is eliminated, and you can have dinner on the table in under 15 minutes. How great is that? What do you plan to do with all of the extra time that you gain during the week thanks to meal prepping? Share your meal prepping photos with us on social media using the hashtags #backtofresh and #naturesgreens, and be sure to tag us! We’d love to see what you’re cooking in your kitchen, and how you’re incorporating our meal prep tips into your week. Dairy is a huge part of your life. Don’t believe us? According to the United States Department of Agriculture’s research, each American consumes 154 pounds of milk per year (nearly 20 gallons!) just through drinking cow’s milk. This doesn’t include the amount of dairy that is consumed through other dairy products like butter, cheese, and ice cream. Milk is produced in all 50 states and from 2004-2014, the United States is the world’s third-largest dairy product exporter. There are also 270 million dairy cows in the world, per the World Wildlife Foundation. Dairy, in the form of cow’s milk, is often one of the very ﬁrst foods introduced into an infant’s diet. But it’s also one of the most common food allergies among children and nearly 75% of the world’s population has some degree of a lactose intolerance. What’s the best way to treat either issue? … with a Dairy Free Diet. What is a Dairy Free Diet and why should you consider one? A dairy-free diet is a diet that is free of milk and milk products. To go completely dairy-free means that you are eliminating primary sources of dairy from your diet including milk, cheese, butter, cream cheese, cottage cheese, sour cream, custards, puddings, ice cream, gelato, sherbet, whey, and casein. If you’re allergic to milk protein or if you have a lactose intolerance, going dairy free might be the best option for you. What are the beneﬁts of having a Dairy Free Diet? How can you get your nutrients on a Dairy Free Diet? By excluding dairy products from your diet, you are putting three critical nutrient intakes at risk: calcium, potassium, and magnesium. One of the very best ways to ensure that your body is getting the amount of calcium that it needs is by consuming calcium rich foods. You can supplement your diet with leafy green vegetables like collard greens and kale, with vegetables like broccoli and okra, and with oranges. You can also choose to drink a milk substitute like goat’s milk, coconut milk, or almond milk. 1 cup of Collard Greens contains nearly 25% of the recommended Daily Value nutrition intake. Fruity Broccoli Salad - both the broccoli and the mandarin oranges are providing you calcium in this recipe! If you’re planning to explore a Dairy Free Diet, there are a multitude of beneﬁts, especially if you are allergic to milk protein or if you are lactose intolerant. Just make sure that you are adding calcium rich foods into your diet to make up for what you would typically receive from dairy! The holiday season is great for togetherness and spending time with family and friends. For many, it can be the start of weight gain and unhealthy eating habits. Do not worry! The holidays don’t have to be a constant struggle with your health. We are here to give you tips to help you balance your food and fun while staying healthy and happy this holiday season. Add your favorite leafy greens to your mealtime selections. Use chopped greens in your morning yogurt or smoothie, add them to a lunchtime batch of soup or chili, or cut your dinner side of rice or pasta in half and fill the rest of your plate with sautéed greens. Dish your own plate and place small portions of your favorite holiday foods on it. Controlling your portion size should eliminate overeating. Drinking water will keep you hydrated and curb your cravings. Do not avoid food all day to save room for a great holiday dinner. Starving yourself all day may cause you to overeat! Eat a good breakfast and lunch before hitting your holiday dinner party. Be sure to include protein with each meal to help balance your blood sugar and help you get through the day. The holiday season is not the time to lose weight. Rather than try to lose weight, work on maintaining your current weight and set up healthy eating habits. The New Year is right around the corner! January will have less temptation – a great time to start setting those weight loss goals. Let the time of togetherness be your focus this holiday season. If you overeat at one meal, do not beat yourself up. You will not gain weight from that one piece of pie –healthy eating is a process and we are here to help guide you in your Back to Fresh journey! For many people fall is the start of an indulgent eating season that begins with Halloween treats, and continues straight through New Year’s Eve. But autumn is also a perfect time to take advantage of the abundance of healthy fare that makes this season special. A few of my favorites are apples, pumpkins, and greens. Fresh, seasonal chopped apples can be whipped into a smoothie, or added to cinnamon oatmeal. Stir finely chopped apples into pancake batter, enjoy them sliced, dipped into almond butter, or sauté apples in lemon water, along with ginger, topped with a crumble made from oats, almond butter, maple syrup, and apple pie spice. Fresh sliced apples make a delicious addition to entrée salads, cooked cabbage, and stir frys. Shredded apple can also be folded into burger patties or meatloaf recipes. And for a healthy treat, try my recipe for kale and raisin stuffed slow cooker apples. After carving a fresh pumpkin, the roasted seeds make a healthy snack, or topping for cooked veggies, salads, fish, beans, and lentils. Fresh roasted pumpkin flesh, seasoned with coconut oil, maple syrup, and pumpkin pie spice, also makes a nutritious, satisfying side dish. And unsweetened canned pumpkin makes a perfect addition to smoothies, oatmeal, hummus, or chili. Greens, a year round superfood, come to life in all new ways this season. Try my recipe for super green party dip, and a variety of fresh and cooked dishes, from coconut collard crisps, to lentil, yam and kale stew, and salmon mustard greens salad. Give your green smoothie some fall flare by blending kale with ingredients like ripe pear, ginger, and maple syrup. Make healthy eating a priority this fall, and you’ll be able to enjoy your favorite can’t-live-without splurges, without compromising your health or packing on any unwanted seasonal pounds. Life is simpler when not having to spend a long time in the kitchen putting together meals for you, your family, and friends. With the kids back in school and time being stretched even more, cooking with a slow cooker or Crock-Pot® may be your new favorite way to save time and eat great starting this September! Check out these tips on how to take advantage of the slow cooker, and all of its wonderful benefits! The best part of cooking with a slow cooker is that you can make a full meal with very little effort. Registered Dietitian Cynthia Sass says, “With a slow cooker you can make healthy, balanced meals with very little prep time.” Ingredients can be prepped ahead of time, then frozen or refrigerated until you’re ready to cook them. During busy weeks when you miss your grocery trip, you can still have a home-cooked meal for your family. At night, jump start your meal prepping for the next day to save time. Before heating up your slow cooker meal in the morning, prepare any ingredients you will be using the previous evening. This could entail pre-cutting veggies, trimming and thawing meats, or even measuring out simple spices that you will be adding to the pot. Seasoning, browning, or caramelizing your meats in a skillet beforehand is a great way to make sure your get the most out of your slow cooker dishes. Sure, it may take a little more prep work, but why settle for an average tasting meal when you can make it better! Remember your mom telling you not to open the oven door because you would let the heat out? Well, with a slow cooker this is most certainly true. Since the point of a Crock-Pot® is to cook foods slowly, continuously taking the lid off will affect the cooking time of your meal. Also, mind your temperature. Realize how long you will be gone while cooking and make sure that the temperature you are using aligns with your schedule, and know that a little temp goes along way. Filling your slow cooker to the brim can cause hiccups when you are ready to eat. Some of the items may not be cooked, while others may be overcooked. Filling the cooker to only half or two-thirds full is best. Also, placing veggies close to the bottom of will help with making sure they are fully cooked. Using dried beans instead of canned ones in your slow cooker is a great way to save money and cut down on the preservatives that come in canned goods. Soak the beans overnight and they will be ready to throw in the Crock-Pot® before you leave for work! Did you know that a slow cooker use less energy that both stove tops and ovens? Using your slow cooker can save you money on your energy bill. A great thing about a slow cooker is that you can throw just about anything into it. Now, we don’t suggest opening up a can of something that is two years expired from the fridge or pantry and using it. However, using canned veggies, beans, and other ingredients that you have been meaning to use will help you clean a spot for new (healthy and unprocessed) items you haven’t had a place for. Now that we have given you some information about making the slow cooker your new best friend this fall and winter, go out and create some great dishes! Check out our website for delicious slow cooker recipes and always follow our Facebook, Twitter, Pinterest, and Instagram for more great tips! Oh, Sweet Kale Of Mine! This July, we are focusing on sweets. Sweets can be healthy and nutritious too, right? Of course! Try to incorporate a healthy and delicious leafy green, such as kale, in your favorite sweet treat. Here are 4 ways that will help you keep your favorite desserts “Back to Fresh”. 1. Use neutral tasting ingredients to cut out unwanted calories! Sugars and sweeteners in desserts help mask the taste of other ingredients. Researchers from Idaho State University found that 8 in 10 people enjoyed fudge made with tofu just as much as they did with butter. Replacing butter with a healthier alternative is a great way to cut calories and carbs. Livestrong.com averages that one brownie of 35 grams, can have at least 20 grams of carbohydrates in it. Kale is a great ingredient to add in desserts. The sweetness of the dessert tends to cut out the bitterness associated with the leafy green. Also, if your kids aren’t a fan of kale, try our recipe for our delicious Brownie Points, they won’t even know it’s in there. Cutting these ingredients in half or eliminating them can go a long way in helping you cut calories while enjoying sweet treats! 2. Use a puree instead of the butter, oil or shortening! Making a puree and cutting out half of the butter, oil or shortening in your favorite sweets can go a long way and help you stay on track with your weight loss and diet goals. Using kale, beets, and plant proteins like beans and lentils are great options for the “filler puree”. Using a puree also allows for you be sneaky with adding greens. These purees help hide the taste and texture of bitter veggies that people sometimes do not enjoy. 3. Mix leafy greens directly into the batter! Make sure you get your daily 5 to 13 servings of fruits and veggies recommended by the Dietary Guidelines for Americans by adding kale or other leafy greens into your batter. Finely chop kale and incorporate it into your dessert batters. This is a simple way to add some veggies into your baked goods, and make sure you get your daily 5 to 13 servings of fruits and veggies. Doing this makes the texture and flavor of the greens less noticeable in your sweet treats! 4. Use dessert recipes that accent kale aesthetically! We’ve talked about mixing greens into your dessert so that you cannot see them or taste them, but sometimes embracing the fact that you have added kale is not a bad thing! Why not impress friends and family with their favorite sweets that have kale, but taste great? A great example of this is our Kale Key Lime Pie. Key Lime Pie has a strong flavor in general, so adding kale to this very tart dessert is easy and as simple as adding to the wiped filling. Tips like these do not take a lot of time, baking skill, or effort. Making these simple changes will help you find ways to embrace starting a “Back to Fresh” journey. Make sure to check out our website for hundreds of more great leafy green recipes. Follow along on our “Back to Fresh” journey on social media, and share your tips on dieting, weight loss, and healthy eating using the #BackToFresh hashtag! The birds are chirping, the grass is green... time to break out the bar-b-que grill! When hosting friends and family this spring, don't feel limited on the dishes that compliment your meal. Here are great ways to keep your guests eating fresh and clean this grilling season. #1 Kale Slaw is a MUST! This light and refreshing treat is a great twist to your normal coleslaw. Why not ditch the unhealthy slaw and substitute with a superfood packed with health benefits? Find the recipe for our Gingery Kale and Purple Cabbage Slaw here. #2 Leafy Greens... on the grill!? Grilling leafy greens such as kale not only gives it a delicious smoky flavor, but it also removes some of the natural bitterness. Massage both sides of the leaves, place them on a piece of aluminum foil and grill them whole. Grilling makes the leaves crispy, almost like chips. Add a fun and unique dip to your table with our Zesty Mustard Greens Watermelon Salsa! Mustard greens are high in antioxidants, a great source of immune-boosting Vitamin C, and help lower cholesterol. Watermelon is high in water content and delivers many other important nutrients, including lycopene and vitamin C.
Ever thought about breakfast on the grill? Whether camping or relaxing in your backyard, the grill can be a nice change of pace to your normal routine. Try things like, breakfast burgers, roasted eggs or pancakes on the grill. When most people think of greens, salads and sautés probably spring to mind. But with a little out-of-the-box thinking you can incorporate greens into nearly any recipe, from savory to sweet, any time of the day. At breakfast, greens can be whipped into fruit smoothies, added to omelets, egg scrambles, and frittatas, blended into pancake batter, and folded into oatmeal. If you’re scratching your head, thinking, “Really, pancakes and oatmeal?” give my recipes a try. When combined with fruit, and ingredients like coconut oil, maple syrup, ginger, and cinnamon, greens are incredibly palatable, and add color, texture, nutrients, and volume to your meals, all for very few calories. Another way to work more greens into your diet is to toss them to meals that don’t normally include them. For example, stir chopped greens into a yogurt, fruit and nut parfait, hummus, potato salad, homemade burger patties, a bowl of mac and cheese, or a batch of soup or chili. Crisp, chilled fresh greens also add a layer of crunch and nutrition on top of piping hot pizza. Greens also make a perfect bed for lean protein, including chicken breast, seafood, lentils, or beans. To incorporate greens into a side dish cut your usual portion of rice or pasta in half and fill the space with a handful of chopped greens. And while you may not think of greens for dessert, there are delicious ways to work them in, from adding baked kale chips to dark chocolate bark, to folding pureeing greens into brownie or cupcake batter. All you need to do is keep greens handy, and get creative. Feeling inspired? Please share the various ways you’ve incorporated more greens into your recipes and eating regime. We can’t wait to learn about your green-infused meals, snacks, and treats! Daily snacking can be a smart habit. In fact, one recent report found that people with the healthiest diets snack twice as often as those with the least healthy diets. Of course, what matters most is what you reach for (and why) when you nosh. To get that right check out these four simple rules of thumb. In other words, don’t snack randomly. Plan to snack during long stretches between meals. For example, if you eat lunch and noon and dinner at 7pm schedule a snack around 3 or 4pm. A well-timed snack can keep your metabolism revved, boost energy, regulate blood sugar and insulin levels, and prevent overeating later in the day. A snack is a chance to fit more nutrients into your day. To maximize that opportunity forego processed snacks in favor of fresh, whole foods. Always include produce - veggies, fruit, or both - paired with other good-for-you ingredients, including healthy fat, lean protein, and whole grains. 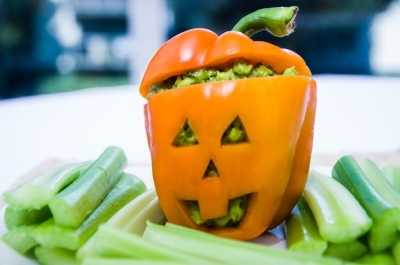 Great choices include: cut veggies, like bell pepper and cucumber, with hummus or guacamole for dipping; a smoothie made with leafy greens, fresh or frozen fruit, chickpea flour, nuts or seeds; or hard boiled eggs, paired with avocado or olive tapenade, and veggies or fresh fruit. Too often we munch out of habit, boredom, procrastination, or simply because food is there. Commit to becoming more discriminating about the “whys” behind your snack choices. You may discover that instead of being physical hungry you’re actually feeling anxious. Or perhaps you tend eat when others are eating, even if you don’t really need a snack. Once you’re aware of your patterns you can consciously work on making different choices, like talking to a friend rather than easing anxiety with food. My new snack recipes that incorporate greens include deviled eggs, white bean dip, and spiced maple popcorn. But when you can’t get into the kitchen to whip something up, stash healthy portable options in your bag, so you’ll have them at the ready. A small banana and a golf ball sized portion of almonds will do, or an apple with pumpkin seeds. Stocking a healthy reserve means you’ll never have to go without if you’re hungry, or get stuck with a less than stellar option. We have all heard it for years - Breakfast is the most important meal of the day! Eating a nutritious breakfast with fruits and vegetables helps maintain blood sugar levels, prevents binge eating and sets the tone for a healthy day of eating. Short on time in the morning? Don't let that stop you from starting your day off the right way! 2. Add fruits and veggies! Cut up fruits and veggies you can toss into an omelet, oatmeal, or whole grain cereal the next morning. 3. Make a smoothie! Blend some fruit, yogurt, almond milk and kale for a green power smoothie to-go! In 2017, we are continuing our Back to Fresh mission with fresh, new and healthy recipes from our friend and registered dietitian Cynthia Sass. So join us in our #BacktoFreshChallenge by eating fresh, wholesome ingredients and less of the processed stuff. We hope that this new year, brings a new YOU! Start your journey now by making these small changes for a healthier lifestyle. Summer is almost over, but don’t be discouraged! August begins the fun challenge of fueling our brains. With kids heading back to school and family summer vacations coming to an end, now is the time to focus on building brain power. How to do this you might ask? Well, starting with the perfect foods to get your brain cells pumping is just the ticket! Kale, collard greens, spinach, and broccoli are good sources of vitamin E, vitamin K, lutein and folate. Studies have found that vitamin k, lutein and folate are helping keep the brain healthy. This root vegetable boosts brain power according to Scientists at Wake Forest University. Beets can increase blood flow to the brain thus improving mental performance. Eggs, but more specifically the yolks of the egg are the leading source of choline. Choline is a precursor for acetylcholine, a neurotransmitter involved in helping you remember things like where you left the car keys. Eating protein-rich foods like eggs for breakfast can improve overall cognitive performance, according to Swiss researchers. Fish like salmon, mackerel and tuna are rich in omega-3 fatty acids, including docosahexaenoic acid (DHA). In the brain, tends to be very important for the normal functioning of neurons. A rich source of the antioxidant vitamin E, avocados are also high in vitamin C which is associated with lowering the risk of developing Alzheimer’s. Blueberries, strawberries, and acai berries help put the brakes on age-related cognitive deterioration and help rid toxic proteins associated with age-related memory loss. Here are 9 simple ways that will allow you say goodbye to ramen or PB&J dinners, and hello to nutrient-rich “grown up” meals, while still being able to pay the rent! We searched and navigated our way through the best tried and true tips from the pros – the Academy of Nutrition and Dietetics – to bring you information from the nutrition experts including our very own partner and registered dietician, Cynthia Sass. Super Easy Ways to Be Sweet to Your Heart! February is the month of love and American Heart Month. So why not celebrate both? By living a healthy lifestyle, you can help keep your blood pressure, cholesterol, and sugar at normal levels while also lowering your risk for heart disease and heart attack. Welcome to a Fresh 2016! First of all, I am so excited to be the Leafy Greens Ambassador for Nature’s Greens and WP Rawl. 2016 marks the beginning of our journey together where we will make small changes to lead a healthier lifestyle and I am excited that you are in for the ride! So let’s get started and talk about clean eating.